Paint and a spoiler. That'll be 20 grand, please. It's still too early in the Type 991 production cycle to have seen the hilariously long list of special editions that the company ended up cranking out for the Type 997. 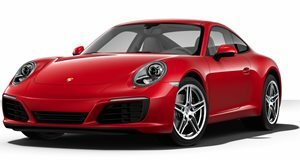 But we're definitely starting to get a taste, in this case, the GTS Club Coupe, a limited production run of 60 units to celebrate the 60th anniversary of the Porsche Club of America. And appropriately enough, all 60 of these will be available only in the US, the 911's biggest market anyway. The car is painted in a special color, available only for this edition, called Club Blau. It has a ducktail spoiler and the interior features leather/Alcantara seats with Carmine Red stitching and a “60” logo on the center compartment lid. The price for the car is $136,060, which is about $21,000 more than the base price. It does include a few options that aren't part of the Club Coupe package, but not quite an entire Fiesta ST worth. But that is a nice shade of blue, and that ducktail spoiler is quite excellent. We're sure that Porsche will have no difficulty selling all of them.